ISO_44001_ 2016: Collaborative business relationship management systems. 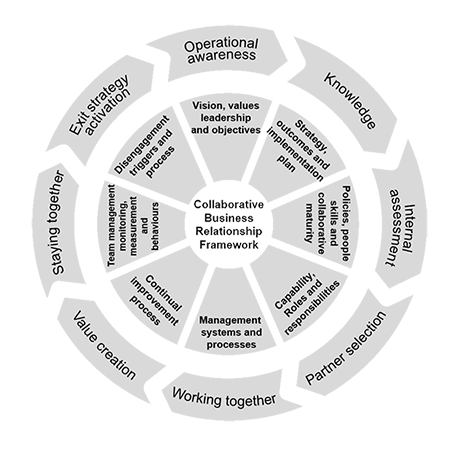 The recent publication of the international standard ISO 44001 highlights the growing interest in the effective adoption and exploitation of a systemic approach to embedding collaborative working into the operating practices of organisations. Whilst most would see collaborative working as a potential differentiator and value generating approach, the adoption of a process based system is less of a challenge than getting the right people and attitudes in place to ensure its success. Developing an effective collaborative focus is a challenge in most business environments. However, where the traditional command and control structure is replaced by cross functional operations, the coordination and direction of activities is even more complex, and one where motivation and influence are vital to success. It is frequently, however, also the single most common point of failure. ISO 44001 has recognised the risks and opportunities associated with collaboration, and risk management is a core aspect of all parts of the standard. In particular, the standard addresses the risks associated with the behaviours of the people working in collaborative relationships.